At this time of year our minds inevitably turn towards holidays and we have been trawling the archives to find out more about holidays of the past. The three branches of the Suffolk Record Office hold some wonderful diaries and travel journals written by people from a variety of different backgrounds, ranging from the Grand Tour in the 18th Century to more modest family holidays. The English gentleman travelling abroad often recorded in great detail differences to his own experience in institutions, architecture, food and people. At home, his travels tell us of a vanished landscape and way of life. We also have numerous photographs and albums of trips overseas and nearer to home and adverts for hotels and guest houses in local newspapers and trade directories. There are plenty of bathing machines, but one of the greatest attractions for families is a system of wooden huts for family and mixed bathing. They are under the control of the Council, and may be hired by the week at a moderate cost, from the residents to whom the Council lets the sites. They afford a veritable seaside luxury, not only for bathing, for shelter from sun and rain, for reading, writing, smoking and lounging, but when tea time comes it is quite the correct thing to use them for afternooon tea, for which purpose the Council have very thoughtfully provided in the rear of these huts, stand pipes for drawing water from the town supply. 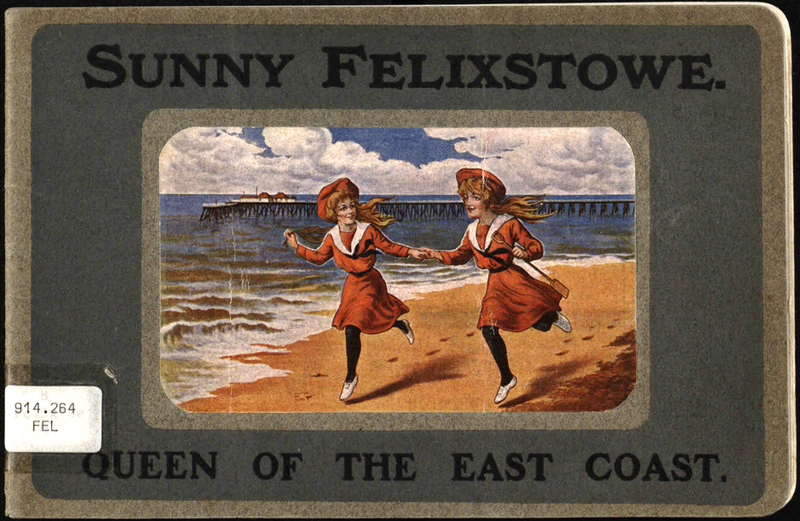 It gives travel options too: by train from Liverpool Street – weekend tickets (Friday to Tuesday) cost 13s and 6d first class - and by Belle Steamers from London, Southend and Tilbury and suggests excursions from Felixstowe including Felixstowe Ferry, Landguard Fort and further afield Ipswich, Woodbridge, Harwich and Dovercourt. 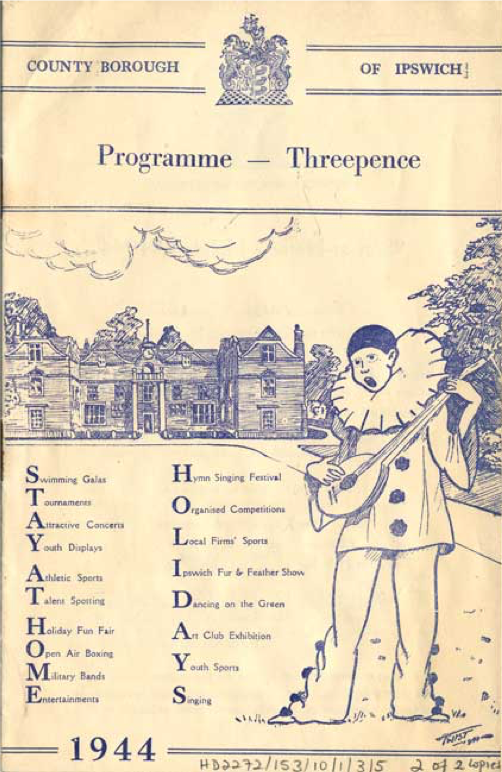 We also have a Second World War ‘Stay at Home Holidays’ brochure for Ipswich (below)– an early type of staycation? These were also produced for other places in the County and show how towns put on extra activities, many especially designed for children. Ipswich had a Fun Fair, Concert Parties by the Co-op Juniors, Dancing On The Green, a Swimming Gala at Broomhill Bathing Pool and other sporting activities and my personal favourite, The Children’s Decorated Pets Competition!